Eataly is a forward-thinking Italian food mega store, where the full lifecycle of food is scrutinized and cherished. 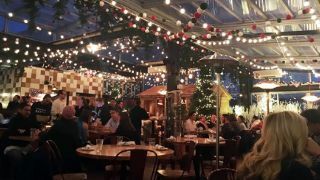 It has two locations in New York City, and the Flatiron locations rooftop restaurant recently underwent a sound system rework to replace a failed DSP. New Jersey-based A/V integration firm Essential Communications did the work, replacing the old DSP with a new Ashly Audio ne24.24M Protea™ digital matrix network processor, with its modular I/O configured to 4x8 to fit La Birreria’s very specific needs, together with three neWR-5 customizable network remote controls for zone source selection and volume control. The IT closet and the audio equipment rack reside three floors below the restaurant, which presented a user-control challenge for Essential Communications. “Ashly’s network-ready neWR-5 programmable wall panel remote was the ideal solution,” said Schwartz. “There was existing CAT5 wiring between the IT closet and the restaurant, which allowed us to tie in the three neWR-5s without running any new cables. And of course, the neWR-5 works flawlessly with the ne24.24M’s Protea DSP. For small and intermediate sized jobs like this, having Ashly’s well thought out user interfaces is super important. I don’t want to spend all of my limited time programming an overly complicated DSP, and I certainly don’t want to bring in a third-party user control; that invariably takes the job to a whole new level that the customer doesn’t want to pay for. It’s much simpler and cost effective to use Ashly’s proven DSP and user interface system!” La Birreria’s Ashly neWR-5 network remotes control zone volume and source selection individually for each zone.For more information, visit www.ashly.com.